The lens of the eye bends light rays to produce a sharply focused image upon the retina. New lens fibers are constantly being formed by cells in the outer portion of the lens. As new fibers appear, older fibers are pushed toward the lens center. Unfortunately with time and aging, the crystal-clear lens is clouded by the compressed fibers. This process is called lenticular or nuclear sclerosis. Lenticular sclerosis is simply a hardening and thickening of the lens that results from normal aging. The lens becomes gray, and the pupil appears cloudy. 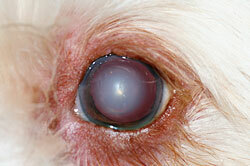 It does not cause blindness, though in advanced cases depth perception may be altered. Animals usually retain enough vision to function well within a familiar environment. No treatment is required unless a true cataract (opacification of the lens) forms, in addition to the lenticular sclerosis.